In a previous post, I talked about a great tool to analyze the best domain prices with domcomp. However, what are the limits of the costs reduction in technology? A website for an App. A homepage for your business. A presentation website where you can share your CV: 1 and 2. This kind of website are called Bootstrap websites and here you can search a few more examples. The only thing you need to do is download the chosen template, open the main file (index.html) with a text editor and adapt the texts. Finally, replace the photos in the respective folder, and upload your website version on the hosting folder. Is this the best solution? No, you would not be working with a nice interface, and a WordPress website with a beautiful template is better for a basic use. Nevertheless, for 1 dollar you would achieve a great ¨online poster¨. In addition, it will give you a better service than a Wix website or similar. PRO types: In an extreme scenario where you want to add lots of big pictures on your hosting space, or in case the final website does not load fast enough, you can make this trick. Upload big secondary files like photos or js files into a public folder of your dropbox or google drive. Finally follow the manual link them in the index.html so they can load from those external servers. 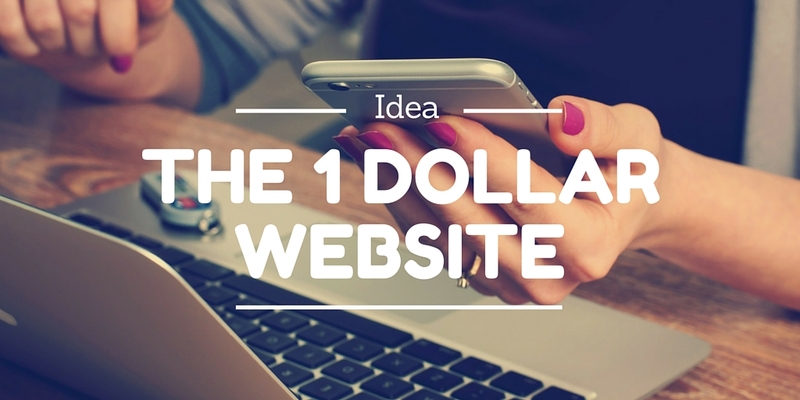 This articles inspired the one dollar website project. If you want to see more templates, suggestions, and tips, please, visit it to get a deeper knowledge of the idea.